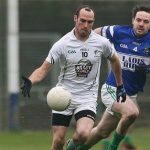 THREE players – including two from Moorefield – are in the running for Kildare footballer of the year. Defender Kevin Murnaghan and forward Adam Tyrrell, who made their senior inter-county debuts in January, are in the hunt for the prestigious prize along with Johnstownbridge star Paul Cribbin. Murnaghan and Tyrrell were outstanding for their club during their run to the Kildare senior title last season while Murnaghan has gone from strength to strength since coming into Jason Ryan’s county panel, securing a starting position in his first season with the Lilies. Cribbin returned from Australia at the end of 2012 after an unsuccessful two-year stint playing Aussie Rules with Collingwood. Since then his Kildare career has blossomed. After winning a Leinster under-21 title last season, he earned his senior championship debut under Kieran McGeeney and was one of the county’s best players through the season. He also helped his club, Johnstownbridge, win last year’s county intermediate championship. The winner of the award will be announced this Friday (28 February) in Moorefield GAA Clubhouse where Leinster Council Chairman John Horan will present medals to Kildare’s championship-winning teams from 2013 – under-21, minor and junior footballers as well as the under-21 hurlers. On the night, the Kildare senior footballers will receive their O’Byrne Cup Medals from 2013 and National League medals from 2012 while the hurlers will receive their 2013 Kehoe Cup medals. Two Celbridge players – Niall O Muineachain and Gerry Keegan – and Coill Dubh’s Eanna O’Neill are in the running for hurler of the year. 2013 club of the year will also be announced on the night with Moorefield, Two Mile House and Celbridge among the contenders.